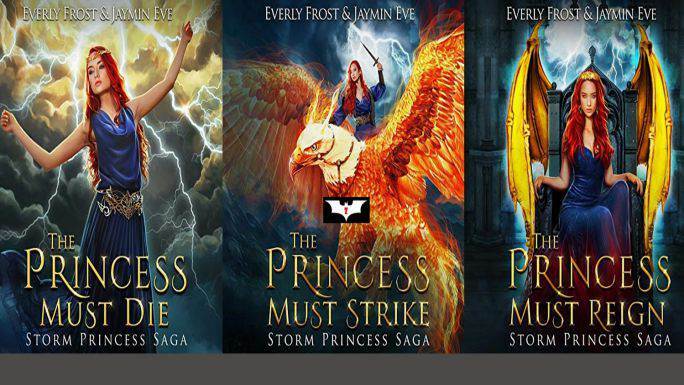 Everly Frost, Jaymin Eve has created a nice blend of fantasy and romance in this storm princess saga. The series develops our faith in fate, a thing that cannot be changed. The storm princess possesses the power to control storms but now it’s time for her to marry, but this marriage is not a simple one as for the selection of the groom there is a contest after which the winner would get the princess’ hand. The thing that makes the story more complex is that we are told at a later stage that the princess too was taking part in the competition because there is a curse attached to her, which holds her death at the hands of her husband thus she wants to win the competition for her own safety. There are also several elements who want to unleash a storm after getting the powers to form the storm princess. The second part of the trilogy starts when the princess wants to save Rath’s life, the only person she trusts and in doing so comes face to face with the gargoyle king who wants the storm power for himself and thus could do anything to have the princess. The last part of the series is an awesome fight between the storm princess and her enemies in which her full powers are revealed and she also faces new enemies who prove stronger than her in the battlefield. The writers have created many series like this one that has a journey to the lands unknown, books like Secret Keepers (1-3) – Jaymin Eve, A Walker Saga (1-7) – Jaymin Eve, Strength (Curse of the Gods #4) – Jane Washington, Jaymin Eve are a must read for someone who has read this trilogy. The whole tale is with a strong plot and the narration by Megan Tusing highlights the character of the storm princess quite well by providing her the pitch that was needed for her character.